How quickly did the last month fly by? Here are my favourite beauty products for January 2016 which features a mix of both budget friendly and high-end goodies. I always enjoy spotting the new special seasonal editions that Original Source come out with throughout the year, and I was thrilled to see that they've brought back an old favourite of mine; Pink Grapefruit! Anyone else remember this? It's zesty, fruity and reminds me of summer - something that's much needed when it's grey and raining outside. 100% natural fragrance and vegan friendly - this baby is exclusive to Superdrug and is such a great budget buy. This is my current favourite face mask as it detoxifies and hydrates at the same time and it's made from just five natural and organic ingredients - what more could you want? I have way too much fun mixing this up as it comes in a powder form and I love how my skin feels and looks after I've used it. I have yet to find an eye cream that will completely eradicate my dark circles and to be honest, I think I'm more likely to come across a unicorn than find one. However, I will happily use one that gives me a noticeable brightening effect and this one from Bee Good does a fantastic job of doing just that. It also hydrates my dry undereye area like a dream and is perfect for my sensitive skin. I can see why this won a CEW Beauty Award last year! Speaking of dark circles, if you need a quick fix after a late night, these undereye patches from Masque Bar are brilliant, and again they gave me a noticeable brightening effect. You apply them for 30 minutes or you can wear them overnight, and they make you look like you've had 8 hours sleep instead of 4. I'd use these for mornings where I have an important job interview or meeting, or for a special occasion. Great to have in your skincare stash. Lastly, this new release from B. quickly became a favourite after just a couple of uses because of its dual purpose as both a primer and an anti-blemish treatment/preventative product. It's got Salicylic Acid in its formula to help banish spots and control excess sebum, and my makeup goes on so much better when I have this on underneath. Cruelty-free and suitable for vegans. 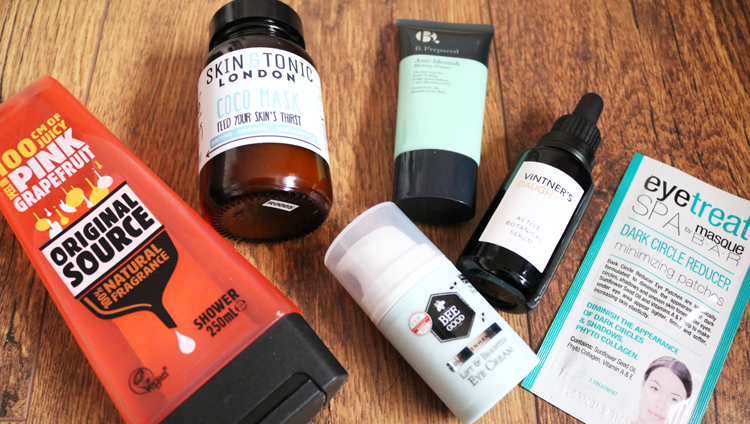 Seriously love that Skin & Tonic mask, don't own another mask like it. I know I'm going to be so sad when my Vintner's Daughter runs out! 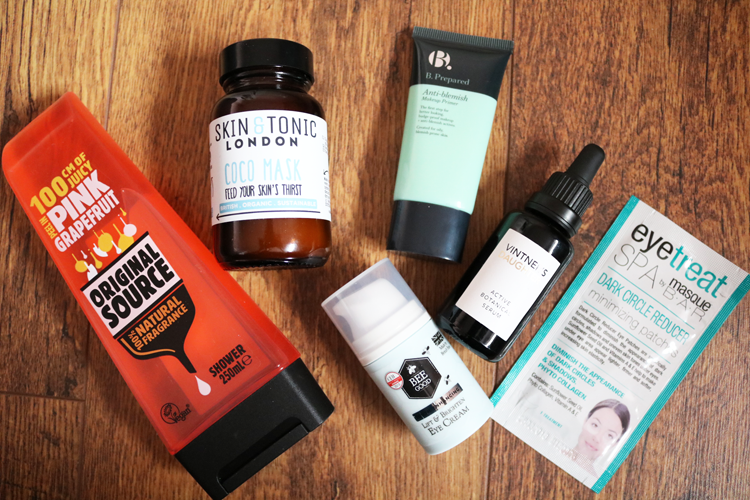 Eek I could never splurge that much, no matter how good my skin feels! I definitely need those eye masks, my eyes are so puffy at the moment!